Shall we see two works of art that are more than twenty-feet tall? What does this gigantic piece of sculpture remind you of? Does it look like an enormous cup? A dark tower reaching toward the sky? An ancient tree firmly rooted in the ground? A powerful tree-giant about to come alive? Do you wonder what materials it is made of? It is made of many layers of coarse and bumpy wood. Do you wonder how the artist made such a piece? After all, it is more than twenty-feet tall! Over the course of one year, the artist and her crew cut large sections of cedar wood with a saw and then hacked and chipped away layer-by-layer. They screwed the sections together and glued each layer in place. They coated the wood with black graphite using a paintbrush and then scoured the wood with steel wool. Do you know what graphite is? Graphite is the material used in pencils and is called lead. Describe the color. Is the piece completely black? No, if you are lucky enough to see this work in person, you will notice it has many shades from deep black to silvery gray. Over time the work will weather even more. The bumpy parts will continue to turn silvery gray, while the deep crevices will remain black. The piece is called Ogromna. Ogromna means something forceful and powerful. Does this piece look forceful and powerful to you? I will tell you a little secret. Across the top of Ogromna there is mesh, and on top of this mesh there are green plastic snakes. Why do you think the museum workers put green plastic snakes on top? To scare away the birds and prevent them from nesting, of course! After all, snakes are predators of birds. What do you know about real snakes? Like the body structure of all creatures, the body structure of a snake helps it to move and hunt. How so? Many snakes have skulls with numerous joints. These joints make their jaws highly mobile such that they are able to swallow prey much larger than their heads. How do snakes attack their prey? They swallow them whole while they are still alive or they constrict them by holding them tight. Some snakes use venom to kill their prey. The venom of some snakes can be strong enough to kill a man. Snakes range in size from the tiny thread snake that is four inches-long to pythons that are up to twenty-nine feet in length. How do snakes move? Most snakes move by gripping surfaces with the scales on their bellies. A snake’s entire skin is covered in scales and has a dry texture that is either smooth or rough. You may be interested to know that mature snakes will shed their skin once or twice a year to replace the old skin and get rid of mites and ticks. Young snakes that are still growing will shed their skin up to four times a year. Shall we continue and see another sculpture that reaches even higher into the sky? This work is called Askew. Does Askew look like some kind of tree? Perhaps it looks like the trees that grow here in North Carolina. Does it look like a crape myrtle or a dogwood tree? What can you tell me about crape myrtle trees and dogwood trees? Crape myrtle trees are known for their colorful and long lasting flowers, while the blossoms on dogwood trees are the North Carolina state flower. Perhaps Askew doesn’t look like either one. 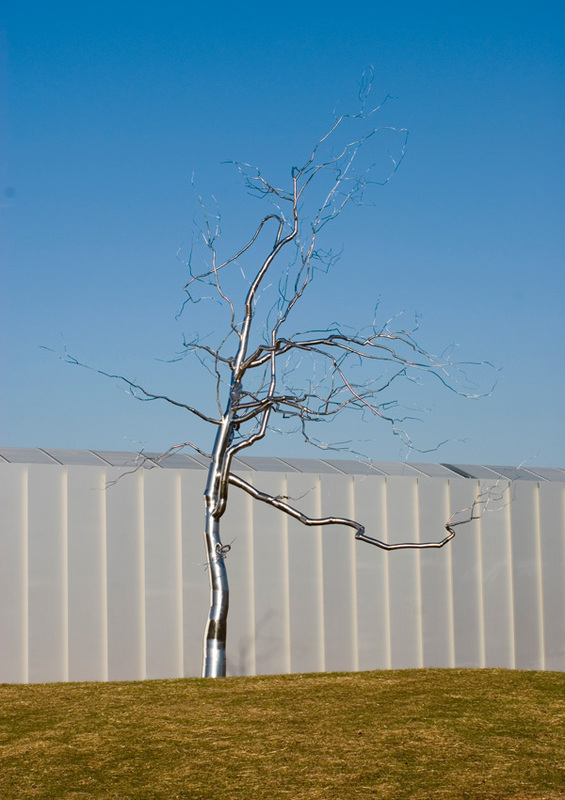 After all, crape myrtle trees and dogwood trees are relatively small, and this tree-like sculpture is nearly forty seven-feet tall! Perhaps this work looks more like the longleaf pine, the North Carolina state tree that today grows up to more than one hundred feet tall. Do you know your state tree and flower? The artist who made this sculpture calls it a dendroid. This means it has many looping and spreading “branches” that seem to grow out of its trunk. What do you think it is made of? It is made of stainless steel that reflects the sun and sky. How did the artist create a sense of balance and proportion in his work? Some of the branches are quite thick and other branches are as thin as the tiniest, tiniest straw. How do the individual parts come together as a whole? How is the work balanced? Is it symmetrical? Asymmetrical? It is asymmetrical. Does its asymmetry give it a sense of movement? How so? Is there anything you wonder about? Do you wonder how the artist made it? He carefully cut, shaped, welded, polished and combined many pieces of metal pipe. Use your language arts skills. 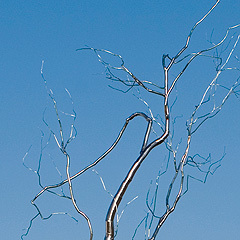 Is this tree-like sculpture whimsical? Magical? Alive? 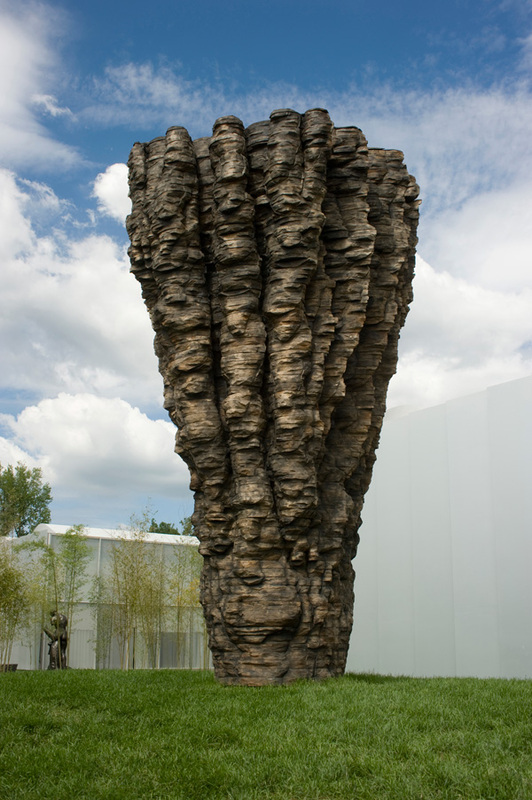 The artist was inspired by real trees found in nature. Was he successful? Unsuccessful? How so? If you are lucky to see this work in person, perhaps you will spy a bird perched at the top! The life cycle of a plant consists of growth, survival and reproduction. A tree is a plant with an elongated stem, or trunk, that supports leaves or branches. A tree is part of an ecosystem. What is an ecosystem? An ecosystem is a biological environment in a particular area in which all organisms live and interact. It includes the physical components of that environment, which include air, soil, water and sunlight. Give specific examples of how industrial activity has altered our natural world and affected ecosystems. Population has increased, forests have been cut down, land has been cleared, buildings and factories in cities and towns have been built, vegetation has been planted, roads have been paved, and dams have been built. All this industrial growth, including the invention and use of trains and cars and planes, has led to a sharp increase in pollution and the extinction of many species of plants and animals. What can each one of us do to protect our environment and cut down on pollution? We can carpool, use reusable bags at the grocery store, use less water, use efficient light bulbs, turn off the lights when not in use, and compost to recycle discarded plant and animal matter. It may just be me, but this tree-like sculpture seems to be alive. What do you think? Does it look like a real tree or is it a fantastical creation? Would you like to see Ogromna and Askew in person? All you have to do is visit the North Carolina Museum of Art in Raleigh, North Carolina. Ogromna and Askew are in the park at the museum. Or perhaps you would like a tour. Tours of the collection are given daily, except for Monday when the museum is closed to the public. If you prefer, you can contact the museum ahead of time and arrange for you and your friends to have a private tour. I’m sure a docent at the museum would be happy to show you and your friends Ogromna and Askew and many other works of art. Whether you visit the museum on your own or have a tour with a docent, it will be well worth your time!